This Valentine’s Day some will say “forget love – I’d rather fall in chocolate!” Well now there is a way you can have both! 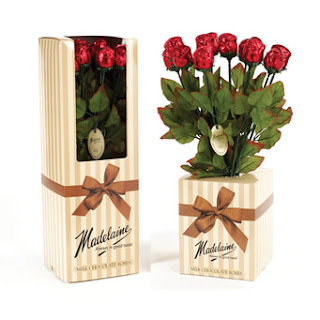 The Madeline Chocolate Company has been making high quality chocolates for all occassions since 1949, and their Valentine's Day chocolate edibles are incredible.We absolutely love the smoothness in their chocolates. Give your loved one a chocolate rose bouquet, available in a variety of colors nestled in graceful long stems with lush, silk leaves, all packaged in a floral box or a sweet kiss with fun shaped chocolate lips. The variety of sweet and unique gifts is amazing and is sure to melt anyone’s heart-especially if it’s made of chocolate. The Madeline Chocolate Company would love to give away a collection of their specially selected Valentine's Day chocolates to one lucky winner from the USA, in a random draw to be held by Random.org on February 9, 2012.
i'd rather fall in chocolate too! Oh, how I love Chocolate...would love this. i love chocolate and would love to try these! Such a great giveaway! I checked out their site and they have so many yummy treats! I'd love to try their chocolate! I'd love to give these to my daughter for Valentine's Day. She loves chocolate almost as much as me. I follow you on Google+ (Madeline Brubaker). February 14, 2012 is my 25th wedding anniversary. I would love some chocolate to celebrate! I love how the box turns into the vase - so cool! Thank you for the giveaway.